In the Dari language, farkhunda means “happiness.” The word is often used when celebrating Nowruz, our New Year holiday, which we celebrate on the first day of spring. We say in Dari: “May your New Year be filled with happiness (or “farkhunda”). It was an Afghan girl named Farkhunda. She was accused of burning the Holy Qur’an outside a holy shrine, and then a group of dogmatic men outside the mosque murdered her. But this is not the whole story as we have all come to find out. At first I hoped it was untrue, but in just moments the news websites were all reporting the mob death. 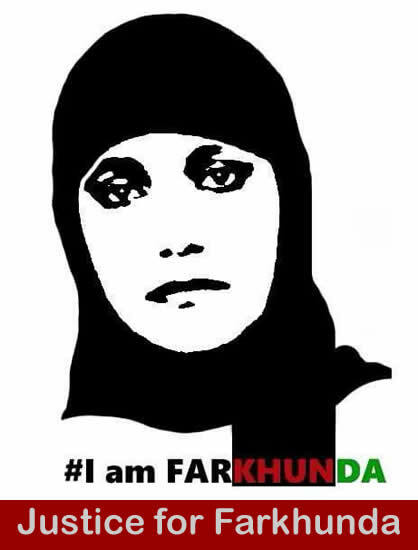 I watched the videos of Farkhunda’s beating on my computer, and with each blow, I could feel Farkhunda’s pain. With that, a mob of barbarous men attacked. She tried to explain that she had done nothing, but their hearts were made of stone. Police did little to help. Many other men watched and did not help her, but took videos. Someone drove over her with a car and then others set her body on fire and threw the body into the dry river. News sites began quoting police as saying Farkhunda was mentally ill. Her father later said that the police had forced him to say that so that people would stop the demonstrations against the police. Farkhunda had not burned the Qur’an. She was innocent. It gives me so much sadness. These men did not think about what they were doing, whether she was guilty of something, or why they were beating her. The attackers now say they were emotional and they regret the killing. These murderers clearly don’t know much about Islam or the Qur’an, which rejects such behavior. So far 57 men have been arrested. A commission established by Parliament has now stated that the accusations made against Farkhunda were false and the mullah is the main person to blame for inciting the riot. Farkhunda’s family says they want justice for their daughter, but they don’t trust the justice system. At Farkhunda’s funeral, only women carried her coffin and buried her. They would not let men carry it. It is the first time this has happened in Afghanistan. These women showed the killers that Afghan women are united in support of women. The road of Shah-do-Shamshera where Farkhunda died is being renamed in her honor. I am proud of the way the women raised their voices, and that women in Afghanistan are actively fighting against violence and injustice. This piece has been published on Women’s eNews. You have done a beautiful job, dear Zahra, writing about about what happened to Farkhunda, and the effect her murder had on you personally. Please keep reading and writing and expressing yourself so clearly. I am proud of what you’ve done here. Please keep up the excellent work! I saw there. Just as I was startled by a sentence I read in your essay. Give the world a window….brave.